Deep down in the sewers, the liquid metal robot has at last found Don’s secret lab and the remains of Baxter Stockman strung up on the wall. Baxter encourages the robot to assimilate his brain quickly, as he’s aware that Don’s set up a trap. 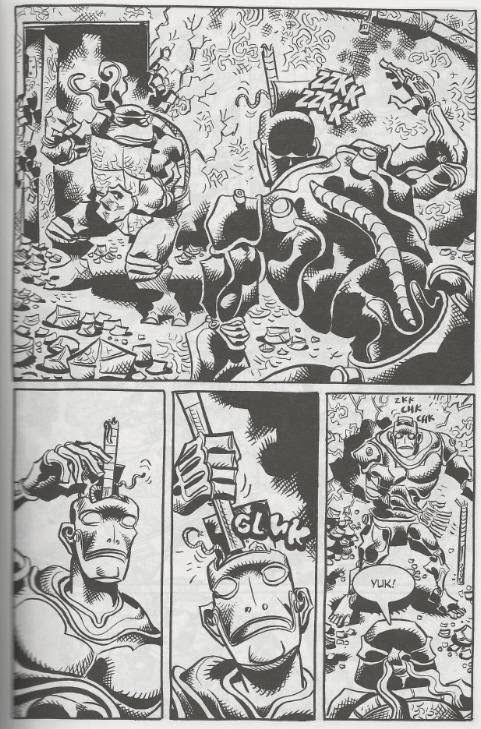 The robot opens the compartment in his head and sticks out his brain-eating tube right as Don springs into action. Don stabs his bo into the brain compartment and breaks it off, jamming the lid open. He then lures the robot away from his lab and, getting the best of him, drops a grenade into the open brain hatch. The liquid metal robot explodes and begins to reform. Don takes the opportunity to go grab his “secret weapon”: the dog that belonged to the homeless man the robot ate. By pure luck, the dog happens to be named “Baxter”. Don asks the dog to sit and speak at the sound of his name, proving to the robot that the dog is indeed Baxter. Content to fulfill his objective of assimilating Baxter’s brain (any Baxter's brain, really), the robot kills the dog and takes its form. 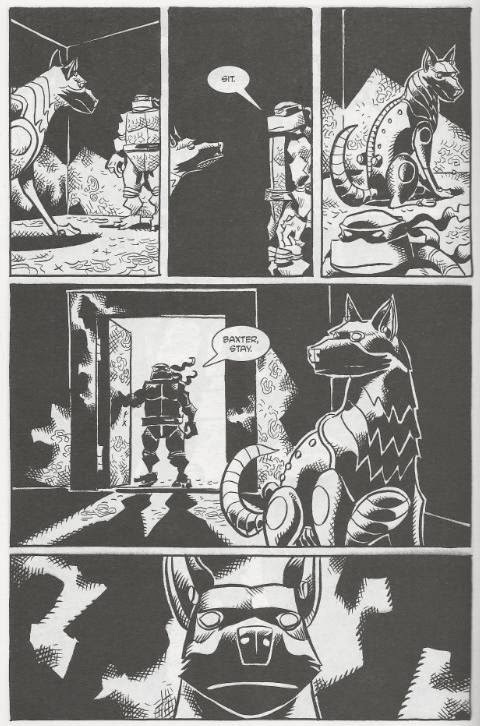 The robot dog is now mindlessly obedient to Don and follows him down a winding path to an ancient and forgotten area of the sewer, where Don has a high-tech vault. Don directs the robot dog into the empty vault and tells him to sit and stay. Don then shuts and locks the door behind him, destroying the key remote and calls it a day. *This story is continued from Donatello: The Brain Thief #3. *The dog, Baxter, belonged to the homeless man from Donatello: The Brain Thief #1. *Depending on what continuity you ascribe to, Don will revisit Baxter again in either TMNT (Vol. 3) #24 or TMNT (Vol. 4) #9. I “read” this damn thing in 30 seconds. There are less than fifty words in this comic (total of forty-one, actually; I counted). Wow. “The Brain Thief” wasn’t the series I was expecting or hoping for and at the end of the day I was very, very disappointed with it. 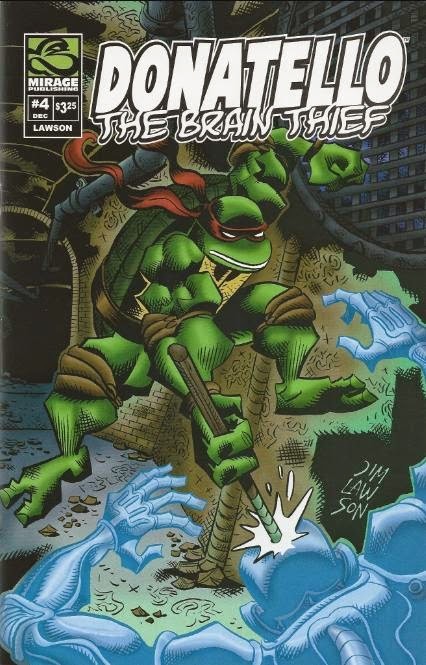 Don, the most intellectual and sophisticated of all the Turtles, wound up with a mindless fight scene of a miniseries that ran for four practically content-less issues for a total price of $13 bucks. What could have been a fascinating introspective mini on Don’s character, as he goes toe-to-toe verbally and intellectually with Baxter Stockman wound up being nothing more than a shallow action movie with more pages of empty sewer corridors than meaningful dialogue. The last of the character-themed miniseries, this is truly a sour note to end on. If there’s one saving grace, I suppose it’s that the resolution was fairly clever. The dog conveniently being named “Baxter” was pushing things a bit, but it certainly wasn’t the ending I was expecting and, really, a pretty decent way to resolve the threat of the liquid metal robot. Don sacrificing an animal seemed out of character, but his reluctance to do so and the tragic look on his face after the dog died made it clear he wasn't proud of what he did (better not ever let Mikey know about this). So yeah, a decent resolution, but was it worth three issues of build-up? Oh, Hell no. “The Brain Thief” is maybe an issue and a half of content at best, decompressed and stretched out to fill four. Lawson’s overbearing use of empty sewer corridors and page after page of running to build tension and ambiance isn’t nearly as clever or satisfying as he probably thought it would be. Quite frankly, once you’ve seen one empty sewer tunnel, you’ve seen em all. A miniseries that consists of 50% drawings of empty sewer tunnels is just woefully dull. I don’t like to be a mean nerdraging blogger douche, but I have to be honest when I say that “The Brain Thief” was shallow, boring and terribly overpriced for the amount of content you were receiving for your investment. In the grand scheme of the Turtles chronology, it offers absolutely nothing of substance and can be skipped with ease. I cannot recommend it to anyone but completionists, and even then, you’re going to feel ripped off. Grade: F (as in, “For the love of god, I know what an empty sewer tunnel looks like. You can stop now, man,”). Yeah, I gotta admit, man... I'd been looking forward to this arc and was holding off on judgment until having read every issue. Maybe I missed the significance of the "payoff" from the cliffhanger ending of issue 3, but this whole series just screams, "back-up story." I consider this series the biggest bust in the Mirage continuity. Soooo much missed opportunity with nothing to show for it. I felt like all these issues were missing something as I read, er I mean, scanned the pictures... thought bubbles... or dialogue... or anything. Very disappointed in this one. Hopefully Lawson will redeem himself in Tales #70. I just re-read the series in the middle of my Volume 2 binge-reading. Again I had great expectations as the insight on Donnie is fascinating (secretly keeping prisoner an old enemy , I like that). Yet the series definitely fails in delivering a satisfying answer and that really is frustrating. Am I the only who feels like the proceeding of issue #1 is not clear? I have a feeling this plot was correctly used in the fan-Volume 3 finisher only. Without these 2 books, the whole plot is senseless. That is too bad.